The unique LOVE THE EARTH handmade necklace is perfect for the Christian woman who loves Mother Earth and is concerned about the current degradation of the environment. The one of a kind necklace features a beautiful pewter earth cross covered with raised symbols of life: the sun, the dove of peace, an ichthys, a flower, wheat and stylized corn plants. 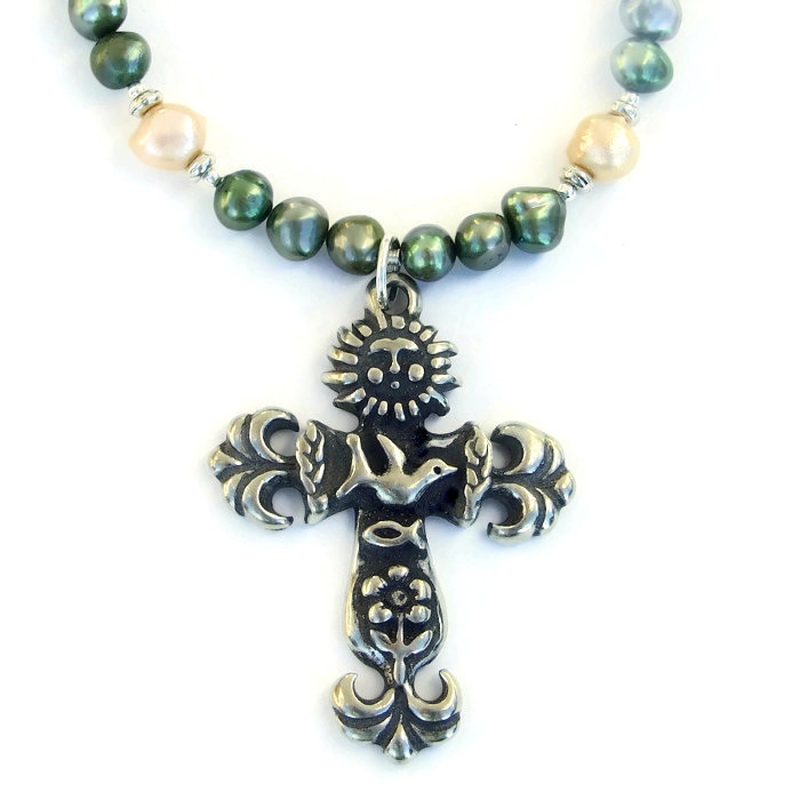 To perfectly highlight the powerful cross, glowing fern green and off white pearls and sterling silver were used. 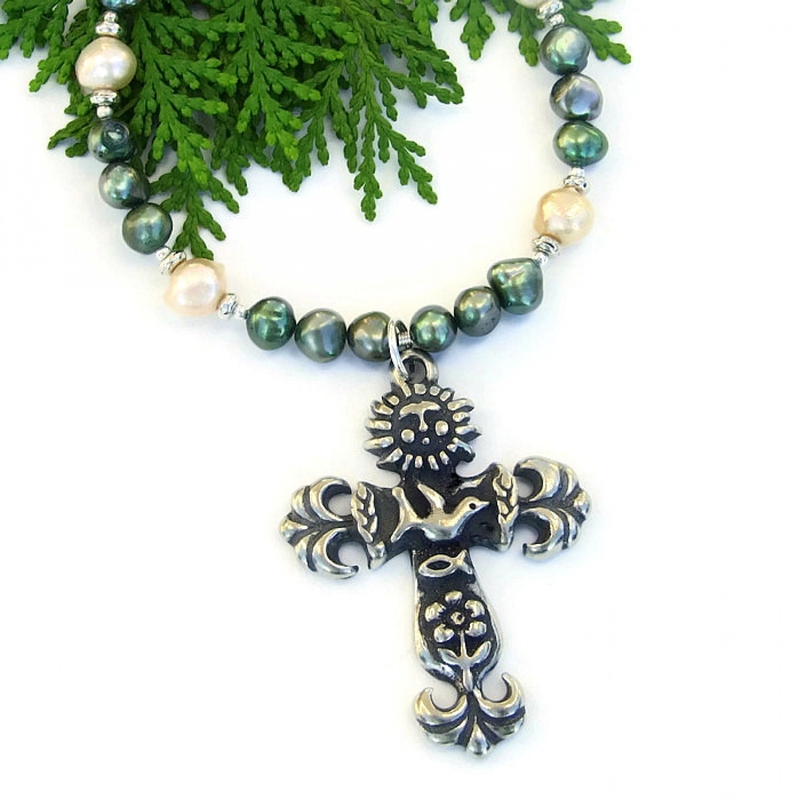 Inspirational and eye catching, the LOVE THE EARTH necklace was carefully designed and handmade by Catherine of Shadow Dog Designs, a meaningful gift for the woman who loves and collects artisan cross jewelry. 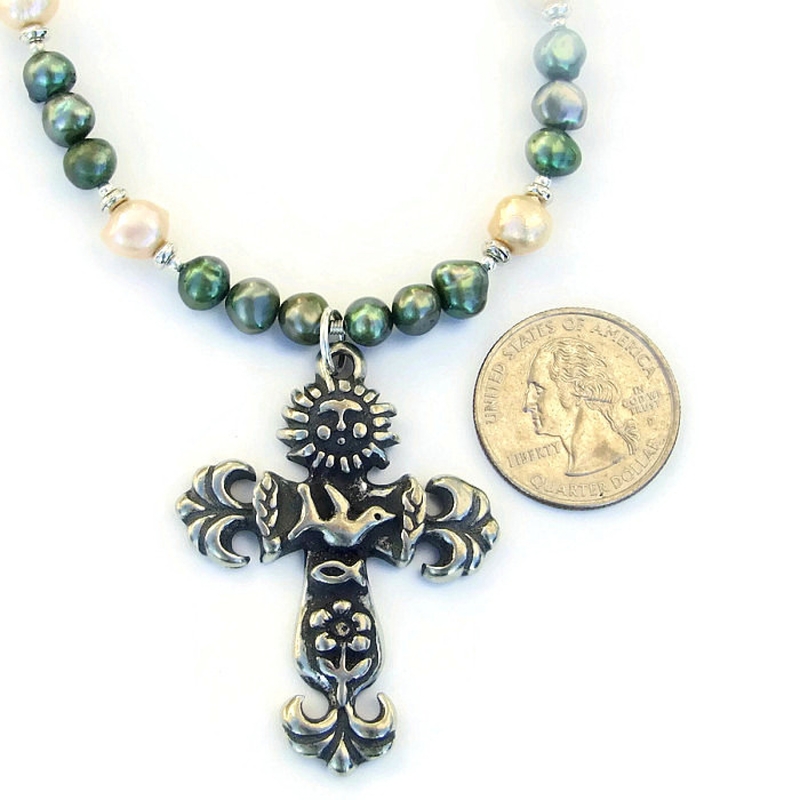 *** For a better understanding of the relative size of the earth cross and pearls used to create the LOVE THE EARTH handmade necklace, please be sure to check out photo # 6 for a size comparison with a quarter. The LOVE THE EARTH necklace will quickly become a favorite necklace for a lucky woman. And, why not, when you have such a beautiful focal cross? The cross was hand cast in the U.S. from high quality, lead free pewter. As you can see in the photos, the cross is covered with detailed symbolism, all things that help support life on earth. Starting at the top is the sun, without which the earth would be just another barren rock in the cosmos. Below the sun is the dove of peace, the ichthys (an important Christian fish symbol) and a flower. On the crossbar, at either side of the bird, are sheaves of wheat. Stylized corn plants can be found at the end of each crossbar and at the bottom of the cross. The symbols are raised creating wonderful texture. They absolutely glow like heirloom silver against a dark, oxidized background. The back of the cross is smooth and unoxidized. The earth cross is attached to the main body of the necklace with a heavy gauge jump ring for security. Since pearls are said to provide loving vibrations and promote sincerity, truth and loyalty. 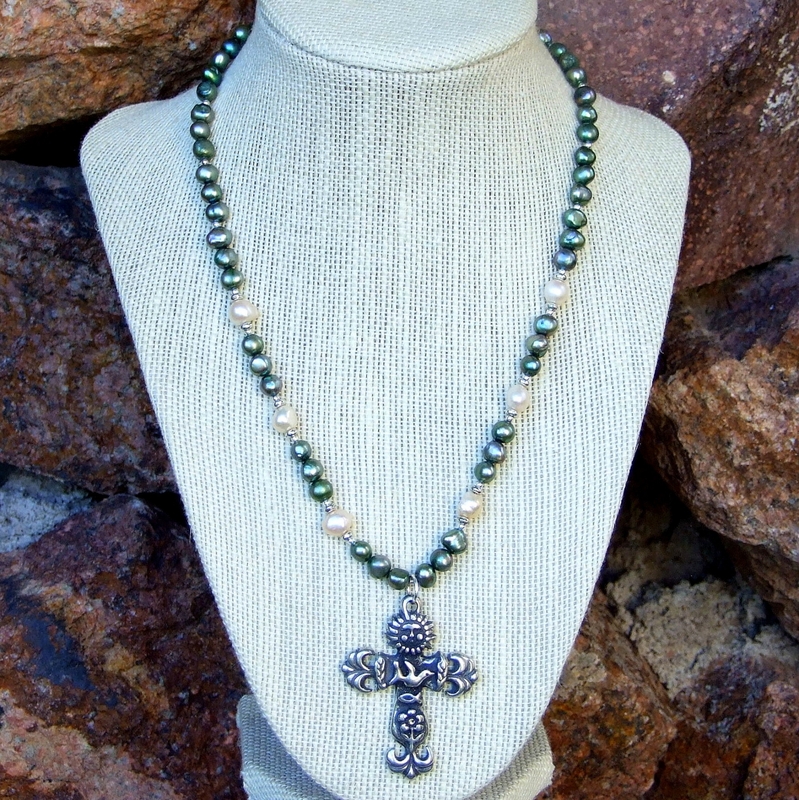 , they are the perfect choice to pair with the earth cross. 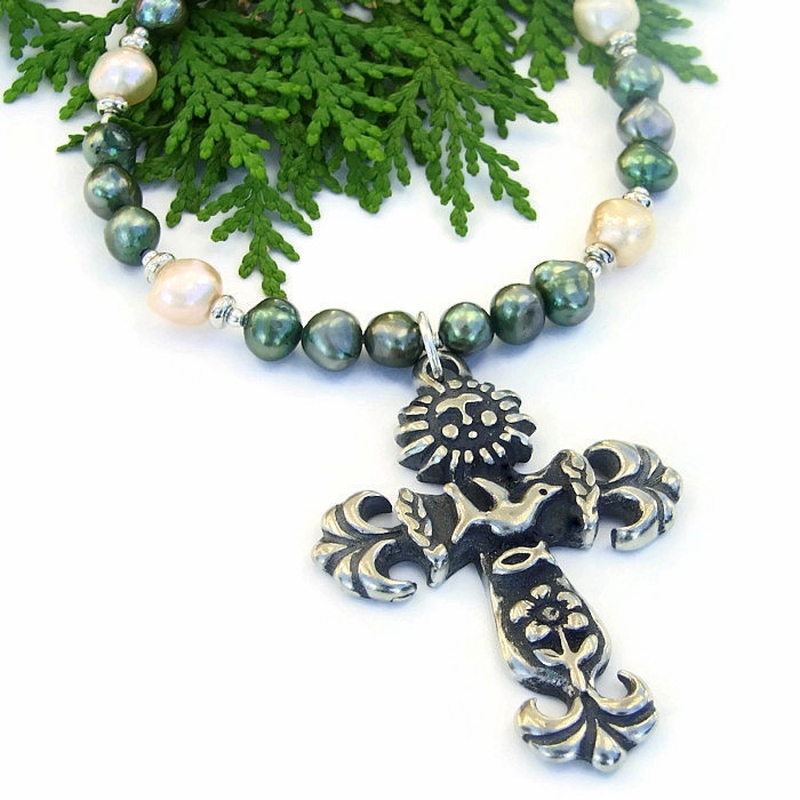 The majority of the pearls are shades of fern green, a lovely acknowledgement to the plants on the cross. 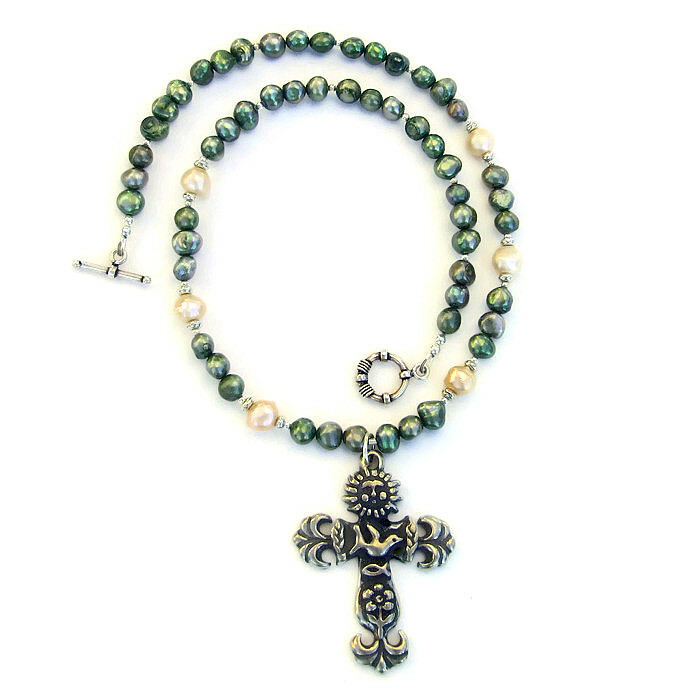 To represent the Holy Trinity, the fern green pearls were placed in groups of three, each group separated by a small sterling silver bead. Three off white pearls were used on each side of the necklace to add interest, each framed with sterling silver disc spacers and small beads. 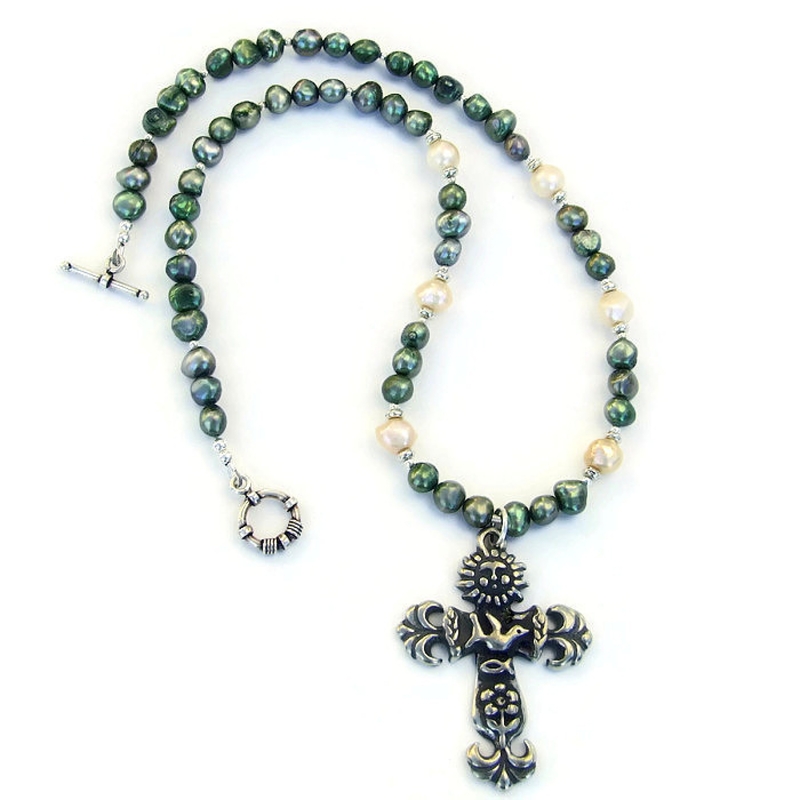 Since the pearls are not perfectly round, they are called “baroque pearls” and may vary slightly in size and shape. Their glow is positively mesmerizing, almost like they have their own light source. The LOVE THE EARTH necklace is finished with a patterned sterling silver toggle clasp set. Crosses are a symbol of the atonement and reminds Christians of God's love in sacrificing his own son for humanity. Pewter is believed to be very grounding, bringing the wearer back to reality. Pearls are used to spread loving vibrations; they are said promote sincerity, truth and loyalty. Silver is a metal of love and healing; it is a mirror to the soul, helping us to see ourselves as others see us. 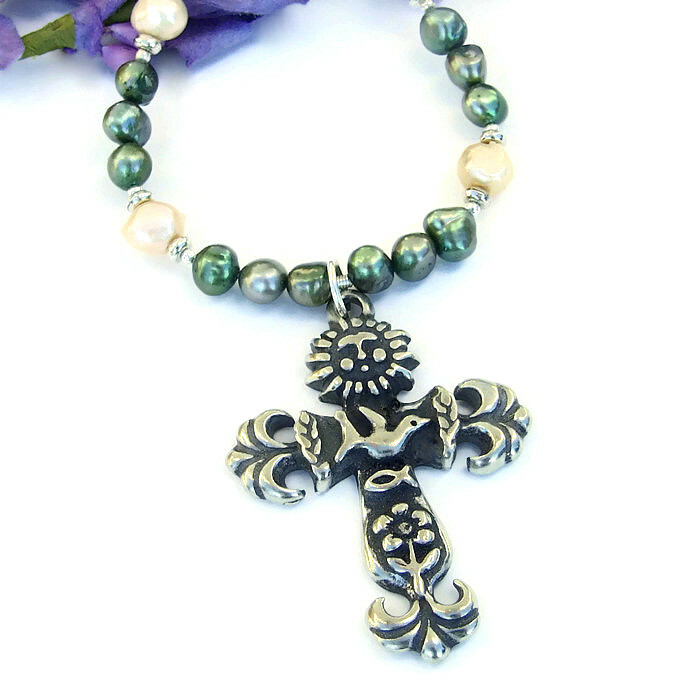 The LOVE THE EARTH artisan cross necklace was carefully designed and handmade in a dog friendly, smoke free studio. The necklace will come with two informational drop tags: one with the piece's name; the other lists the materials used in the necklace and the language of the stones and metals. It will be carefully packed in an organza jewelry bag, perfect for gift giving to a loved one . . . or to yourself!